Panasonic has announced its new Viera LCD and plasma TVs have been given the go ahead to release in Europe, complete with UK-specific technology. 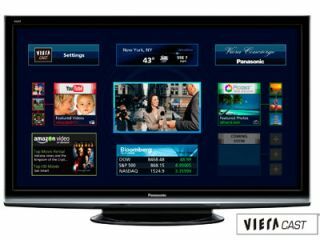 Although partly announced at CES in Las Vegas earlier in January, the new range will use features like Viera Cast for the first time in Europe and inbuilt Freesat. The new line-up, according to What Hi-Fi, features plasma and LCD models, including the Z1 flagship range, V10, G15, G10 and S10 among others. The Z1 plasma range for the UK is a super-slim design with full wireless HD transmission, as well as THX-certification, DLNA connectivity and DivX playback. The V10 series has a super-high contrast ratio of 2,000,000:1 in its plasma variant, similar networking capabilities to the Z1 and Viera Link for putting together a home cinema system with ease, and comes in 42-inch and 50-inch flavours for plasma, and 32- and 37-inch for LCD. The G15, which will come in 42- and 46-inch sizes, has Viera Cast to allow you to watch YouTube and Eurosport, as well as DLNA connectivity and Viera Link. These will be available in 42- and 46-inch size for plasma and 37-inch for LCD. All these models will feature Freesat tuners inside as well, so you can get your ITV HD fix straight from a satellite dish. The new LCD models all feature 800 lines of resolution from Panasonic's new 100Hz Intelligent Frame Creation tech. No word on pricing or availability in the UK, but it won't be long before you can get your hands on the next iteration of Panasonic's new TV panels.